Buddleia Nanho Purple is a dwarf variety. That being said, instead of 12-15 feet the Nanho Purple Butterfly Bush gets to 5-6 feet. That is tame enough for many borders. 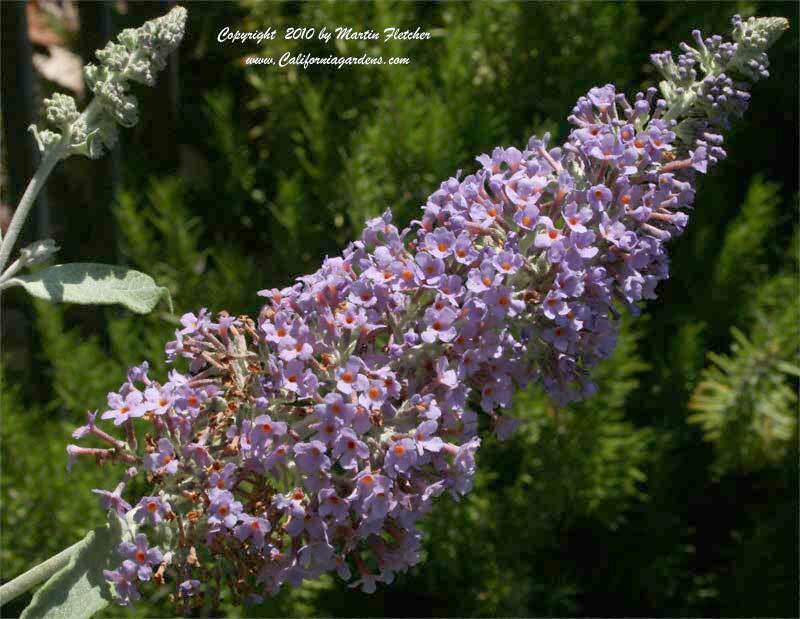 Buddleia Nanho Purple has silver gray leaves and very fragrant pale purple flowers. Buddleia Nanho Purple prefers good soil but will perform quite well in difficult conditions. The Nanho Purple Butterfly Bush responds well to regular hard pruning. As branches age the plants slow down dramatically and are renewed by hard pruning. Plants are hardy to 0° F or lower, far below any conditions we are likely to get here in California. Buddleia Nanho Purple is a popular nectar source for the Red Admiral Butterfly and the Mournful Duskywing and with hummingbirds and is a great addition to the butterfly garden. Flowers and foliage of Buddleia Nanho Purple the Nanho Purple Butterfly Bush. High resolution photos are part of our garden image collection.